"Seeing the Writing on the Wall"
Finally, we figured out a way to practice what we preach. You tell them not to write on the walls, then you pull out the pencil and mark up the door jamb! Hang one of these hand made surfboard growth charts on the wall instead and send a clear message that you're excited about their growth. Our children's and toddler's growth charts are a fun way to measure your growing child. Transfer old marks on the wall onto your new surfboard growth chart and have a permanent record that will be handed down to future generations. Size is 10"x 45"x 1/2". 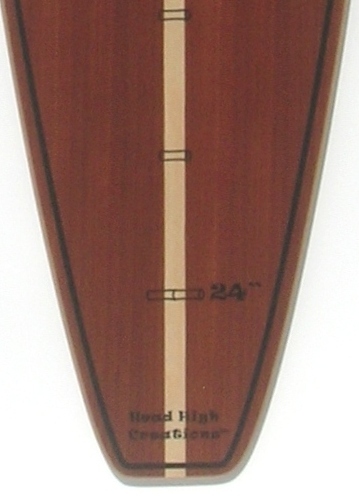 Click on the swatches below to see a close-up of each surfboard growth chart . Easy to install hardware and instructions come with each growth chart, except with the Thin Ply Charts. Scroll Down To See All Available Styles. Click on the swatches to see a larger view of each chart. Personalization Now Available! Personalize your chart with your child's name. Please enter your child's name the way you wish it to appear on the chart in the box below. Then click on "Add To Cart" to add the customization option.